Kids come to us all the time saying they can’t wait to learn their back handspring…or learn their full. We know — no matter what level your child may be, they can’t wait to learn more! We encourage this sort of eager learning and positive spirit in our athletes, but only when safety is kept in mind as well. If our tumblers cannot complete their pass safely, we need to work the basics again to ensure they have the right technique moving forward. Even the most advanced tumblers need to keep working on the basics. One of the most basic skills that often needs to be perfected is the round-off. Yes, your child may already have a round-off. Maybe they’ve been doing their round-off for years now. However, if they are landing crooked, trying to throw a pass out of a short round-off, or lack a strong needle kick, they may be struggling to land their harder running tumbling passes. Our mission is to correct this issue by getting to the source of the problem. 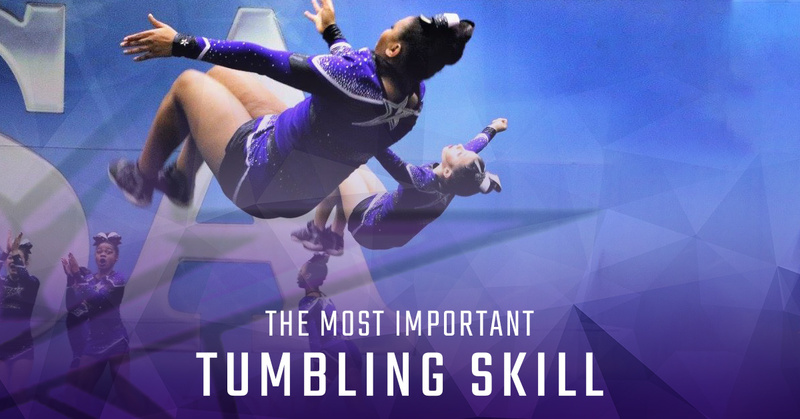 If you’ve ever seen a running tumbling pass, it will include a round-off about 99 percent of the time. Sure, that round-off may be preceded by a front punch or a front walkover, but that round-off is surely going to be included every time. Why? Because a round-off is your power. It is the source of your momentum for throwing harder skills. It propels you forward and allows you to finish your tumbling pass, no matter how many elements it may include. A proper round-off will allow the right tumbler to just keep going and going. However, a sloppy or crooked one will likely result in injury or a slow tumbling pass that will quickly come to an end. Each of these is essential for learning harder skills in our running tumbling passes. In all honesty, a round-off is made up of several elements. First, a lunge. A proper lunge allows the tumbler to propel themselves forward with enough power to continue their pass. Next, the cartwheel. This cartwheel rotates the hips of the tumbler to send them backward and align them toward their destination. Finally, the handstand snap-down. When the legs come together, the snap-down allows the tumbler to block off the floor once again and use their rebound to throw their skill. Beginner tumbling classes are filled with new tumblers working on handstands, cartwheels, and lunges for a solid portion of the time because these skills are the foundation of all tumbling they will learn moving forward. The sooner your athlete perfects their round-off, the sooner they can begin to learn harder skills! Sign up today for tumbling classes! At MGA Cheer Extreme, we offer tumbling classes for all levels, allowing each student to be challenged appropriately. Get in touch with our team today to learn more and schedule your child’s first class.